Booklice, though harmless to humans and they aren’t major pests compared to others like rats, ants, roaches, mosquitoes, and termites, these lice love to feast on the binding materials of books as well as the mold present in old books. In addition, booklice crave for food particles found in kitchen. These tiny crawlers are hard to spot, for they are only 1/16 inch in length and they are wingless. 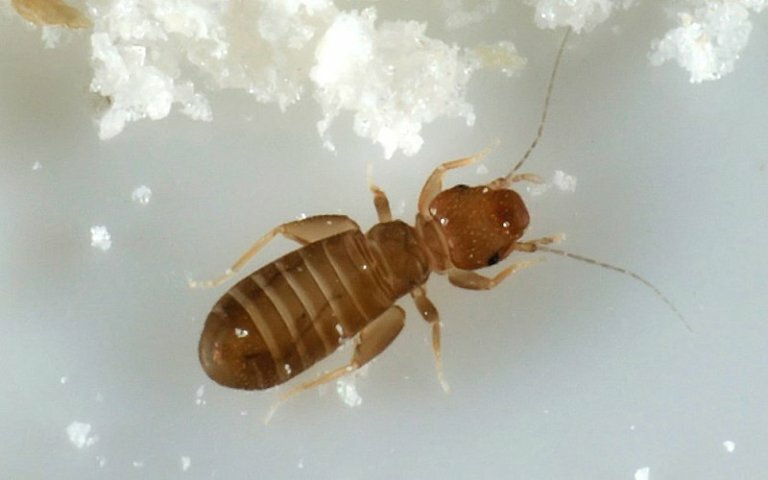 They are usually found in moist and humid areas of your home and in food items. To get rid of them, you must ensure that the foods infested with them are properly disposed of. If you have humidifier in the kitchen, turn it off. Clean your kitchen cabinets with soapy water, rinse well and wipe them with a clean cloth. After that, leave the cabinet doors open until the insides are dried off completely. Lastly, vacuum your kitchen and the rest of the house to make sure that there are no leftover food particles. Remember to vacuum the fissures on the walls as well; you can also put some diatomaceous earth or talcum powder in the crevices and other crawl spaces to dry out these areas. If there are still booklice around, use insecticide intended for booklice and only spray in well-ventilated areas. You can kill off the booklice in an infested item by placing it in the top section of the refrigerator where the ice is stored, because the freezing point can “undo their existence”. For old books with mold in them, you can use mold cleaning products which you can buy in shops.